A really attacking team selection was announced at 3.30pm. Both Ramsey and Ozil playing along with twin strikers Laca and Auba. Width provided by wing backs maybe or some other genius Emery plan to extract a win from such a difficult fixture? We started well but Lukaku had the best early chance, clumping the ball into the turf and up on to the bar. What a banger from Xhaka! Perhaps he should take all the penalties if he can send the keeper the wrong way when he’s 35 yards out. We’d started well and Xhaka’s goal was the crowning glory; the best keeper in the Prem left floundering. 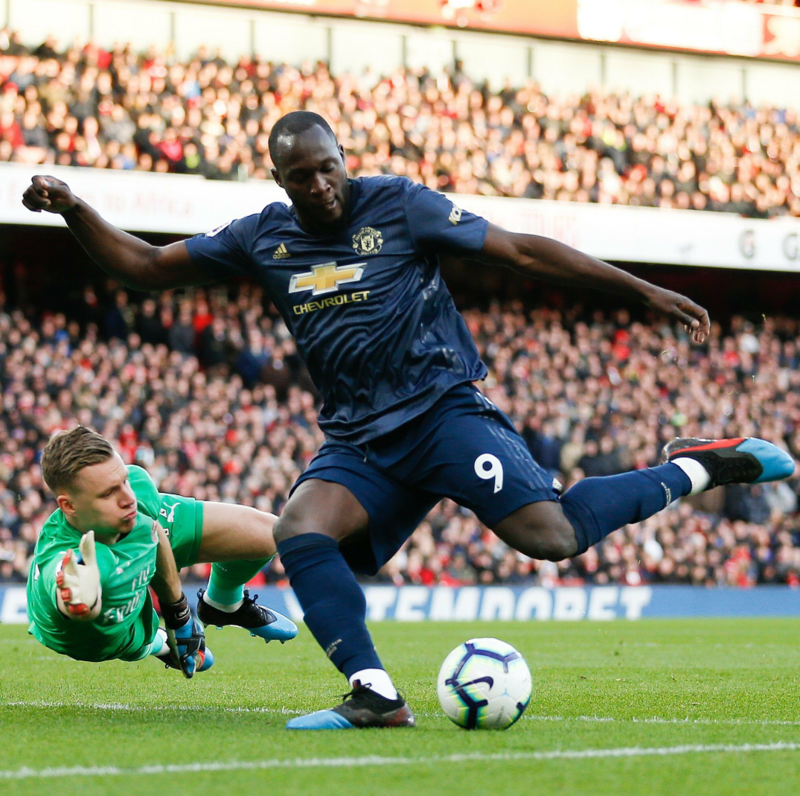 The red mancs perhaps had the better of the chances in the remainder of the first half, with Lukaku attempting to round our German keeper but being foiled by an oustretched glove and another nobody bouncing one off the post when Leno had it covered. Our best chances came from driven crosses from Wardrobe, Laca just failing to sneak one in at the near post and Auba cutting back instead of launching himself at the far. One nil at half time and for a change we defied the xG, scoring with our only shot on target and United couldn’t capitalise on their slightly better chances as these half time figures show. Arsenal’s second half performance was a credit to each and every one of the players and also a credit to their manager. Man U’s chances were far less dangerous after half time and when they did threaten to score, Leno was invincible in goal. The save with his foot when Lukaku was put clear by Rashford was superb. The penalty on 69 minutes proved to be a real make or break moment in the match. Fred (not the Trinidadian one) had clumsily challenged Laca in the box and the salad dodger decided that to even out the 99 things he’d given Man U, he’d finally give us something. 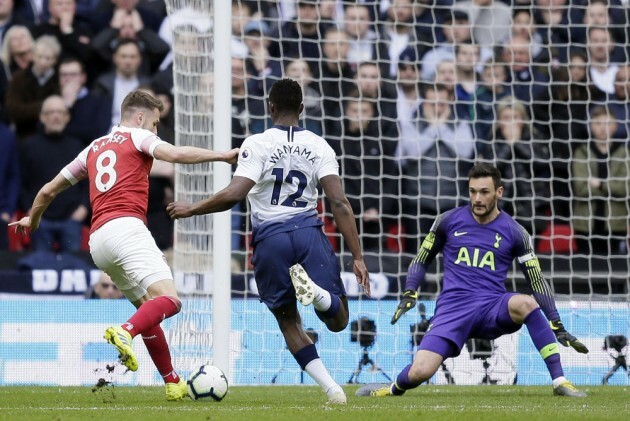 There can’t have been many Gooners around the world who weren’t looking at Auba through their fingers as he sought to make amends for missing against the spuds. 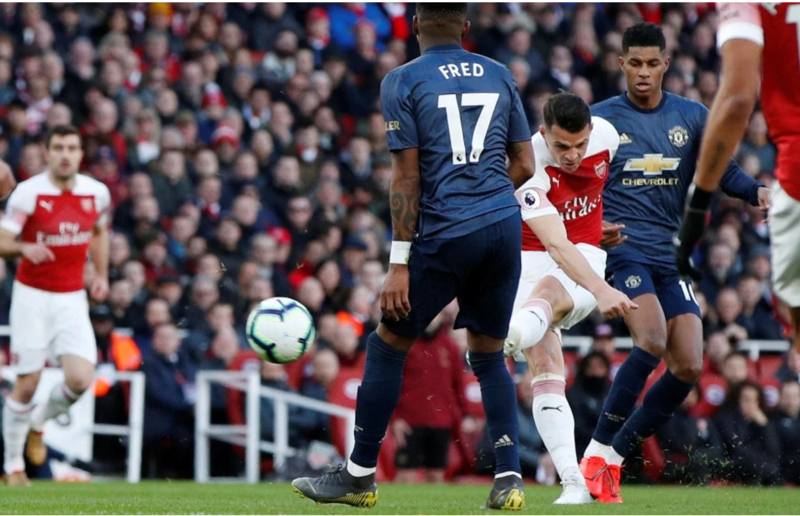 As it turned out, it was a penalty of supreme ease as De Gea was still going the wrong way from Xhaka’s swerver in the first half. The ball went straight down the middle and the Emirates went into raptures. With the spuds losing and chavs sneaking a point late on, the winner of this match was sure to reap the benefits in the race for the CL places. Beating the red mancs so conclusively and ending their great run was the stuff that dreams are made of. What a great game of football it was, too! Sky picked the best game of the weekend with chances galore, drama and non-stop action. Unai Emery’s team must have made him a very proud man. Aaron Ramsey won eight tackles against Man Utd; more than any other player on the pitch and at least twice as many as any other Arsenal player. That was a game we had to win, and we had to show real character to do it. Whatever you think of Emery, he has almost immediately made us competitive in big games. I love it. That a chap, however pleasant he is, can go from being manager of a piss-poor Norwegian team to becoming the New SAF in a couple of months. He is riding a wave of post-Merino relief. Same happened at Chelsea post- Benitez. Just think of the CL winning manager Roberto Di Matteo – where is he now? Is OGS a good manager? Possibly but an ape could have come into a dressing room full of highly expensive players and done better than the Portuguese. 3. The PSG victory is amongst the finest in CL history. Poppycock. MU were totally outclassed throughout the game. It was a travesty of justice, I cannot remember a luckier win. What may not be a myth is that MU have been blessed with the lucky stick. 4. MU are playing fine football. More cobblers. A midfield that focusses upon kicking it’s opponents, a very muscular and physical backline does not make for entertainment. The new boy, Tom Mac-something is a re-incarnation of that deeply unpleasant Irishman who battled our Leader, Sir Patrick. 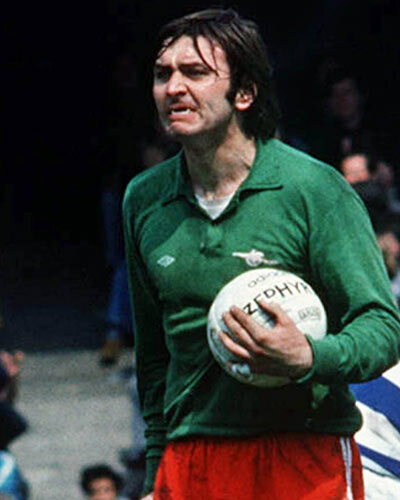 Keane was a vision thug and so id this chap. 5. Referees. It was never a penalty in Paris. Once again a referee chose to favour MU – it wasn’t the first time and will not be the last. Throughout their history they have consistently been given dubious decisions (who can forget the Rooney dive?). The chap who gave the pen on Weds is driving home in his new Ferrari. Today we have the dreadful Jon Moss, a man who has consistently been anti-Arsenal biased. Expect Xhaka to see Red. What is not a myth is that United have the world’s best goalkeeper, De Gea is almost as good as Schmeichel. Fantastic player who wins MU at least 10 points a season. If confidence wins games, and it often does, we are in for a heavy defeat. We were awful midweek but could and should have won at Spurs; hopefully the Spurs performance will be uppermost in our chap’s minds. We have a lengthening injury list added to the ban on Terreira, so the team almost picks itself. I would certainly start with Ramsey. Do you think Elneny will get a few minutes – he wasn’t even taken to Rennes! I wrote pre-Spurs that many were hoping for 2 points from the Spurs/MU games. I wanted 6, and we should be half way there. We are not but we can make it 4. MU are not invincible, they are a bunch of expensively collected mercenaries who are on a run of scarcely credible good fortune – it cannot continue. Manchester United Football Club, nicknamed “the Red Devils” was founded as Newton Heath LYR Football Club in 1878, changed its name to Manchester United in 1902 and moved to its current stadium, Old Trafford, in 1910. Arsenal and Manchester Untied both have an outstanding history and enjoy a great rivalry, however this boiled over in 1990 when a brawl between the two teams resulted in both clubs having points deductions in the Football League First Division. 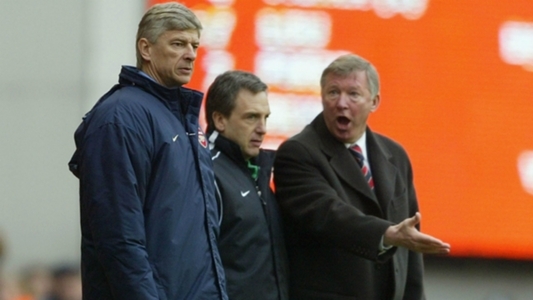 There was also a high level of enmity between Arsène Wenger (1996–2018) and Sir Alex Ferguson (1986–2013), and the two of the club’s former captains Patrick Vieira and Roy Keane. This all came to a head during a league fixture in September 2003 that later become known as the “Battle of Old Trafford”. 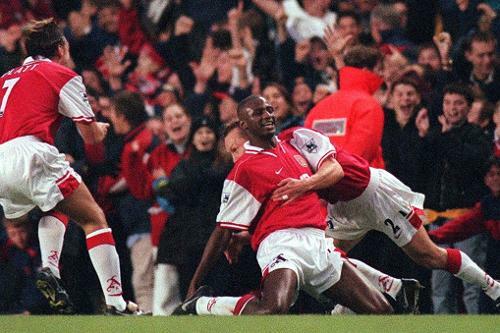 Arsenal players were aggrieved by Ruud van Nistelrooy’s antics – they felt he cheated trying get Patrick Vieira sent off – it resulted in an unseemly player melee. The next season, Manchester United ended Arsenal’s unbeaten run when Wayne Rooney took a dive to win a controversial penalty – after the game there was a skirmish in the tunnel which ended with Sir Alex enjoying some pizza. 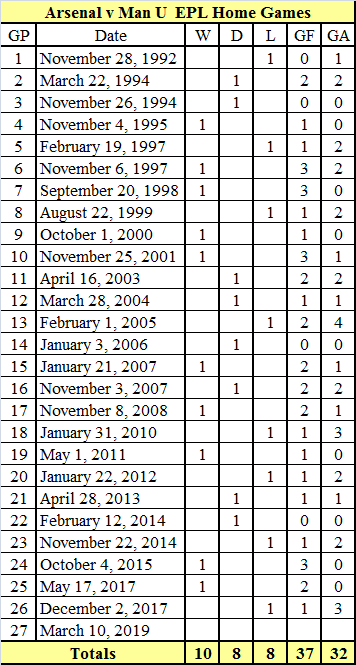 A total of seven red cards were shown in matches from February 1997 to February 2005. Out of interest (mine) here are the players who have made appearances for both clubs. It hurts to write this but the fact is Manchester United are England’s most successful football team they have an extraordinary record of achievements – but I cannot bear to list them and I’m sure that you don’t want me to – so instead I will concentrate on our home games against them. 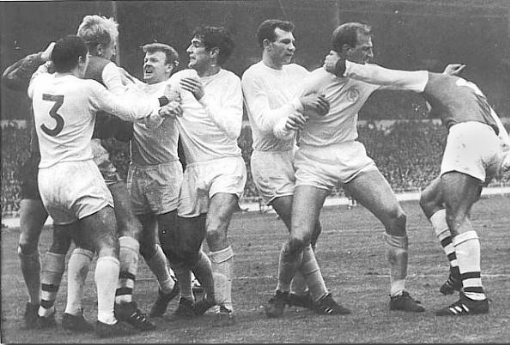 Our overall home record is very impressive and we dominated them at home prior to the introduction of the Premier League with a record of – W44, D11, L18, GF151, and GA84. Even though it is less dominant, our winning home record has continued in the Premier League. 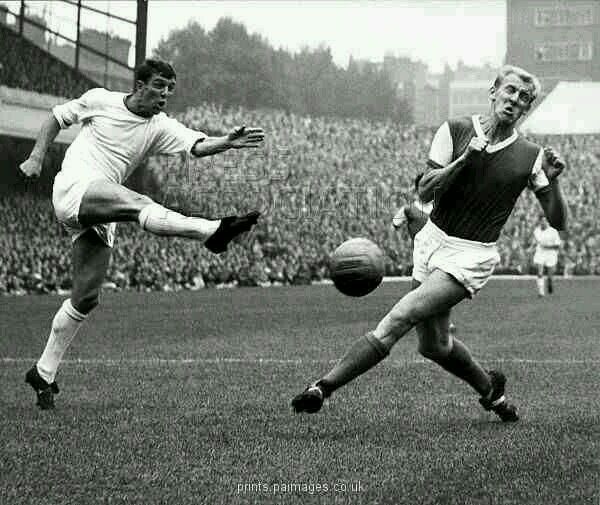 Historically this Sunday’s game is our 100th home league game against Manchester United and a little known fact is that United has lost more away games against Arsenal (54) than they have to any other Football League club – long may it last! What does the rest of March hold in store for Arsenal? The simple answer is, not a great deal considering the stage of the season. Having successfully dealt with our away game to the spuds and been a touch unlucky not to win, we seem to be really finding our stride. Time to build some momentum for the final push. Oh look, there’s a chuffin international break in the last two weeks of March. Dennis save us from this madness. Our fixtures in March continue this Thursday with the first leg of our Round of 16 Europa League tie in France, kick off 17.55pm. Rennes will have had just over a week’s rest before the tie thanks to some club-friendly scheduling by the Ligue Un authorities. Hopefully it will have had a contrary effect and left them slightly short of match sharpness, unlike our brave lads. Lucas Torreira will be itching to play in both the away and home ties since his red against the spuds will see him sidelined in the League well into April. Next Sunday we face Solskjaer’s mob at home in the last game of the weekend, kick off 16.30pm. The match will almost assume the status of 6 pointer. It’s essential we don’t lose, but hopefully home advantage will see us grab all six points. No silly goals conceded on the counter this season, lads, please. 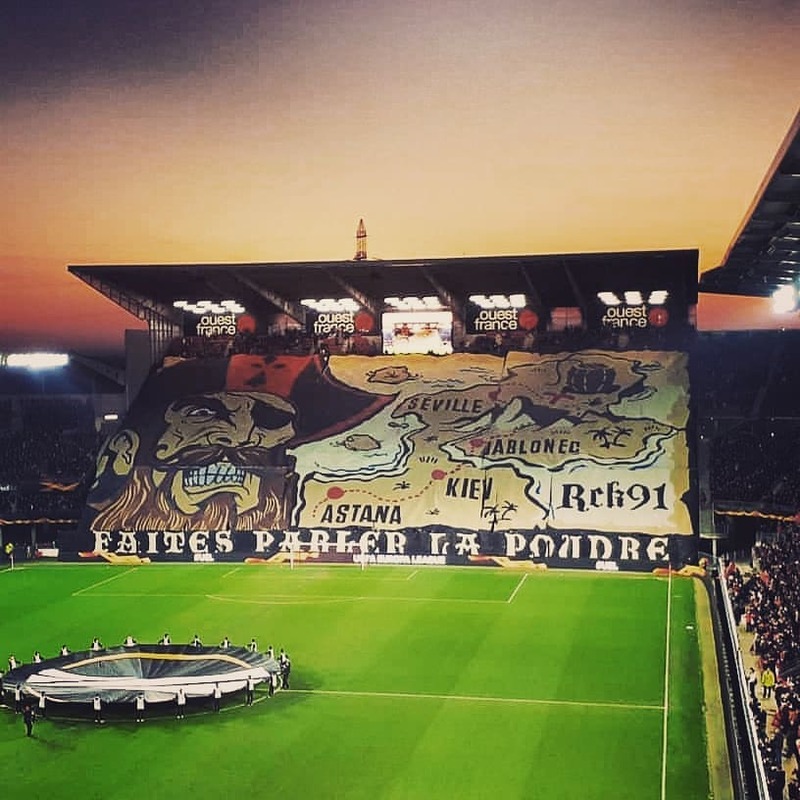 Thursday week we welcome Stade Rennais FC back to The Home of Football. I’d imagine the tie will still be finely balanced with again (hopefully), home advantage allowing us to overcome them and progress to the quarters. The following weekend to the Rennes home fixture, we were down to face Wolves at Molyneux but their participation in the FA Cup has led to this game being postponed and it is yet to be re-scheduled. Therefore, because of the international break (zzzzzzzzzzzzzzzzzzzzzz) and clashing cup comps, we only have the 3 games to play in the whole of the rest of March. So much for building momentum! In the next 11 days we’ll know if our Europa journey will be continuing and also the task left in the final 8 Prem games to reach a CL spot. Then in the following 17 days we’ll have an Arsenal-less break. Baffling.